The da capo aria, which I talked about yesterday, was a form that by 1750 had begun to lose its once enormous popularity. It was a form that was essentially killed by excess. The reign of the da capo aria coincided with the reign of the castrati as the stars of Italian opera. A Minute with Miles is a production of South Carolina Public Radio. The castrati, men who had been castrated as boys, were famous for their high voices and technical virtuosity, and they eventually turned the da capo aria into a vehicle for personal display—excessive display that usually came at the expense of emotional expression and dramatic realism. The good news is that starting with the works of Christoph Willibald Gluck in the late 1700's, arias were stripped of their frills and in a sense purified, and with Mozart then leading the way, the aria regained its place as the most vital means of dramatic and emotional expression in opera. 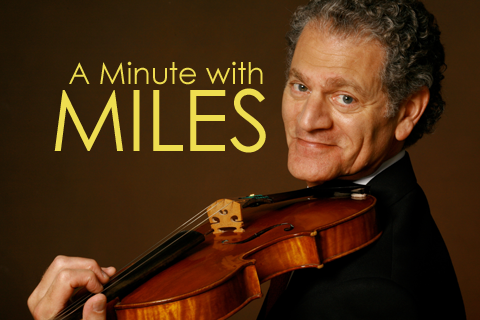 A Minute with Miles – a production of South Carolina Public Radio, made possible by the J.M. Smith Corporation. Arias are the pieces for solo voice with instrumental accompaniment that are found in operas, oratorios, and cantatas. They’re songs, in a sense, but they tend to be more musically elaborate and vocally demanding than the kinds of pieces we usually call songs. The aria - a musical form that’s a kind of song, but more elaborate and vocally demanding than the pieces we usually call songs. The development of opera in Italy in the 1600's is what brought the aria to glory. For about a hundred years, roughly from 1650 to 1750, the principal type of aria in opera, and also in the oratorios and cantatas of such composers as Bach and Handel, was the da capo aria.